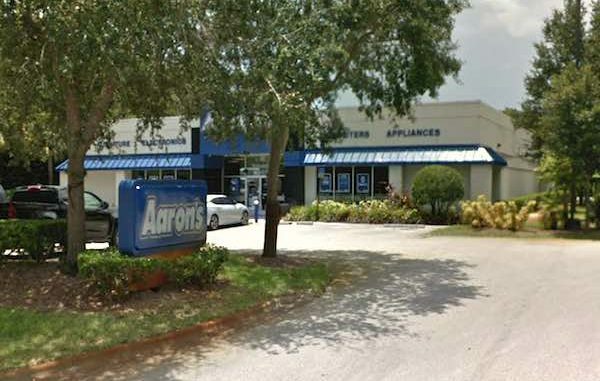 Boy steals parent's vehicle at the Aaron's store in Vero Beach. VERO BEACH – A 14-year-old Sebastian boy was arrested in Vero Beach after getting into an argument with his parents at the Aaron’s store on 20th Street, according to the Indian River County Sheriff’s Office. Philip and Sharon Bridgewater called law enforcement after their son took the keys and drove away in their Jaguar while they were at Aaron’s in Vero Beach. As deputies arrived, they saw the juvenile driving the Jaguar in the parking lot while Mr. and Mrs. Bridgwater was running after him. The deputy attempted to block the juvenile in, but he stepped on the gas and left the parking lot after hitting an Aaron’s company vehicle. The deputy gave chase but lost sight of the juvenile because of heavy traffic in Vero Beach. The juvenile left in a high rate of speed. At approximately 10 minutes later, another deputy found the Jaguar and the juvenile pulled over without incident. The father told deputies that and he and his wife took their son to Aaron’s to return a game. The son engaged in an argument with his mother and then took off in the vehicle. “He stated that his parents were both at the passenger side door with the door open telling him to stop as he put the vehicle in reverse and hit his mom with the door, causing her to fall down,” the deputy said. The juvenile said he left in a high rate of speed because he was scared when he saw the deputy. When asked why he stopped for the other deputy, he said he was tired of running. The juvenile, whose name is being withheld because of his age, was arrested and transported to the Indian River County Sheriff’s Office where he was charged with Aggravated Battery Domestic Violence. He was later transported to the Department of Juvenile Justice.